Quilt, Knit, Run, Sew: Scarf - allmost done! 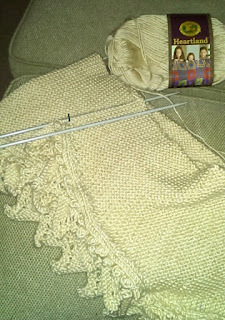 will just be completed and blocked in the spring. Actually, I consider this my practice scarf. It's such a fun pattern to knit. Each point of the scarf requires twelve rows. While south, I'll look for some nicer yarn and I may knit one when I'm south..